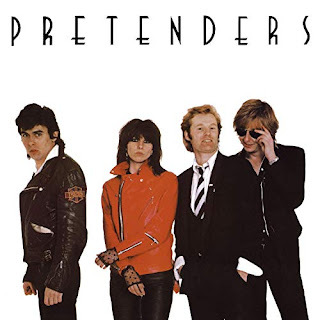 I was fascinated by this group and 1979 was a fabulous kick-off year for them with their first three singles being great commercial and critical successes - so I'd like to celebrate their first release - The Pretenders and Stop Your Sobbing. That the group picked a cover for their first release isn't a surprise given how well they did it. The original by The Kinks is a great track but Chrissie Hynde and her bandmates did a really good re-work: without changing much they managed, in my humble opinion, to turn a good old track into a great one. And it served them very well indeed, thank you! Their key sound, smooth but complex guitars, backs up the base line and the hook ... "gotta stop sobbing now-oh, oh, yeah ... " is infectious in a good way. Chrissie's vocals purr and soar across the guitars and the boys provide great backing vocals. Even done live it sounds as good as the studio production. If it sounds familiar then that's because it was produced by Nick Lowe - a singer / songwriter / producer who'd been around since the late 1960s in various guises, working with the likes of Dave Edmunds and Elvis Costello. But it's little wonder the band came to his attention: having worked at the NME since the early 1970s when she arrived in London from the USA, Hynde had become mates with the likes of Malcolm McClaren and Vivienne Westwood so getting a recording session was probably less problematic for the band than for others. What stood them in good stead, apart form being fantastic musicians, was that they were good songwriters and went on to have many, many hits. A number of those hits were under the belt by summer 1982 when the first of two deaths were to happen as a result of drug addiction, the second happening a year later. It's not the main reason but it's a particular reason that I love their earlier work as for me, the sound is different to what it progressed into and due to the circumstances, has never changed. So, sit back if you will, and enjoy this fab live recording form 1979 of Stop Your Sobbing by the Pretenders.